Piracy is a huge issue in China. Enterprising lawbreakers have loads of ways to make money off piracy, one of which is selling pirated DVDs of movies or games. So it always surprises me when I talk to purveyors of pirated video game hardware and software who tell me that they, the pirates, want to go legit. This last Saturday, my good friend Frank received a new Xbox 360 from his girlfriend Chan. The 360 was an American import that Chan had laying around the apartment. Wanting to play games with his girlfriend, Frank suggested we get his system modded. Frank, a fixture in Beijing's tech industry, recommended that we hit up Beijing's historical Gulou district, a location that was once famous for its gray market game stores. Game consoles are banned in China, and the only way that gamers can purchase consoles such as the 360 or PS3 is through the gray market. Walking down the tree-lined street we arrived at the game store section of east Gulou. Looking at the various game stores, we picked a store with a small, blue front that had a single Metal Gear Rising: Revengence poster hanging in the window. Walking in, the two proprietors, one short and one tall, looked at us and asked us in a gruff voice, "What can we do for you?" "Can you mod our Xbox?" I asked. "How much will it cost and how long will it take?" "Do you have it on you, what region is it?" replied the taller and bigger of the two. The two proprietors, let's call the tall one Liu and the shorter one Yu. 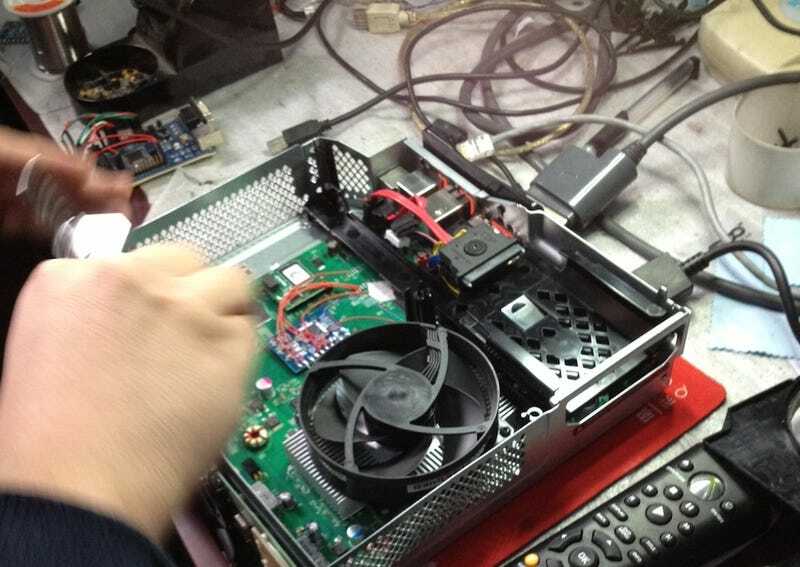 After sorting out that our Xbox was an US import, Liu told us that it would cost about 200 Rmb to "Dual hack" our system in about an hour. Dual hacking is when they mod the 360 so that it can read bootleg discs as well as play pirated games off the harddrive—Yu said it has the best success rate. With nothing to do for an hour, Frank and I decided to wait and chat with Liu and Yu. The store itself, a small room painted in a weird blue hue, had three TVs lining one wall and shelves of PlayStation 3 games and various game accessories on another. In the back, behind an awkwardly placed pillar, was a counter and a workstation. Yu, a small middle aged man, sat far behind the counter in front his workstation, a small desk covered in wires, screwdrivers, drills, a TV monitor and a computer. According to Yu, he's modded hundreds of Xboxes since the store's been around. Liu sat by the counter, taking online orders for video games and hardware repairs. Both Liu and Yu are native Beijingers and, from what's hanging on their wall, they're part of Beijing's Winning Eleven league. Their store, a partnership between three friend0,s has been around since 2006. Hanging on their wall was a photo of the duo with Jackie Chan's most famous son, Jaycee Chan. While Yu was modding our system, in the back Frank and I started talking to Liu. With the annual communist party meeting happening, we asked if the upcoming meeting would result in the removal of the video game system ban in China. "We would like to see the console ban removed," said Liu. "Piracy is a huge issue for us... we make a lot of money from modding systems to play bootleg games, but it's not a good business for us, there are too many variables." The variables Liu points out range from political and legal issues to market fluctuations. Liu and Yu claim that their store specializes in selling legitimate copies of games imported through the gray market and that they pretty much only sell PS3 games. "Piracy, in my opinion, comes from a necessity. Before the 360 was hacked, people still purchased legitimate games... you look at all the PS3 gamers, they can only purchase legitimate games," said Liu. "Sure, once the 360 was hacked, gamers purchased more 360's because they could play $1 games." "However, if consoles were legal in China, there would be China region games which would result in a uniform market." The uniformity of the market, Liu says, will help ensure that gamers don't get cheated and that stores with better customer service will get more patrons. Halfway through our talk, Yu, came over and informed us that he isn't able to dual hack Frank's 360 without swapping out the disc drive. He said it would cost another 200 yuan. We agreed. Yu grabbed a 360 laying around the store, popped it open, removed the drive, and swapped it into our system. Turning our attention back to Liu, we talked about hacking and modding, asking about where the technology for mod chips came from, how they felt about hacking, and what their current stance on the ban in China was. Yu said the mod chips come from a technology company—they come in packs of hundreds and are dirt cheap. Liu said that the technology was a mystery to him and that they just follow directions they found online. According to Liu and Yu, they're both modding based on experience and not actual expertise in electronic engineering. As to the morality of what they're doing, both men said they've got bills to pay. According to Liu, their small store front of about 30 square meters costs $1,600 a month, on top of other bills and inventory. "If consoles in China get legalized, we might be able to stop selling bootlegs and servicing mods," said Liu. "I mean mods are what people want anyway, but if we legalize systems we might actually make money from selling games and systems instead of having to compete and haggle." "With rent and utilities, we're barely making a profit, and our rent's only going to get more expensive."